Dr Harry Merkur, Maria Belista and Sonia Hollands with (back) general manager Sue-Anne Redmond, Jane Gentles and Shivorn Blackman. A new, very modern and swish activity-based workspace will open at Blacktown Hospital in May. Called the B2Hub, the contemporary new design will provide workpoint stations, rather than dedicated desks. There are meeting active zones for individual, group and duo work, some in comfy booth settings and with whiteboards, and quiet zones for focused and confidential tasks. Modern features include video conferencing, touch-pad room bookings and funky colours. 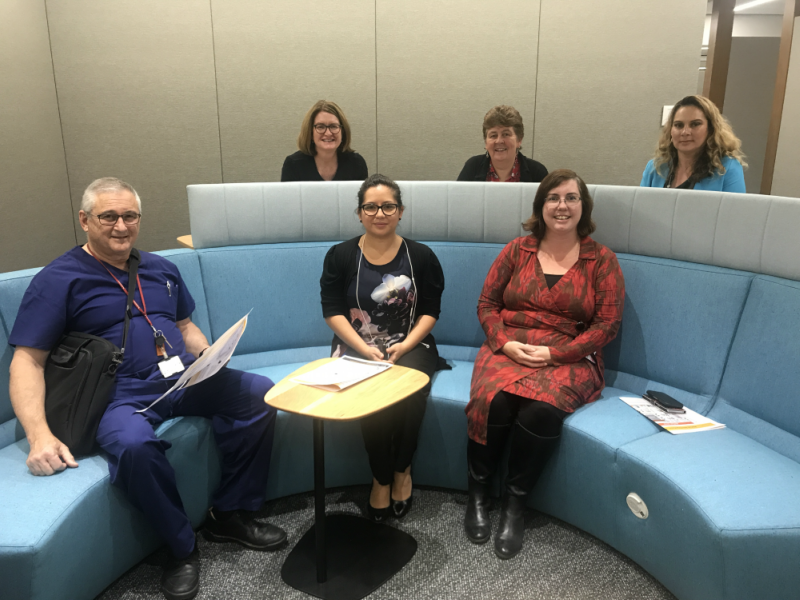 Small meeting pods at Blacktown Hospital, part of new ways of working. It is also connected to a courtyard, which also reaches the area’s Wi-Fi connection. All work areas are IT-enabled for mobile work, and the whole setting is designed to encourage collaboration, creativity and maximum flexibility for an improved staff working environment. The hub will also be used by staff who work across the local health district, and is future-proofed to accommodate additional staff as Blacktown grows to become a major tertiary hospital. Lockers are available for B2Hub staff and mobile team members. Interactive screens show if a meeting room is available, and how long for. The B2Hub is the first activity-based working project in Stage 2 of the Blacktown Hospital expansion. This hub will support the hospital administration, while similar designs on the main levels of the new acute services building will support our emergency, women’s and children’s, operating theatres, intensive care and other staff.